Turkish design studio Red Yacht Design has unveiled its latest hull concept: a sleek and sophisticated 50m luxury yacht by the name of ‘Stella’. Specifically conceived for Mengi-Yay Yachts, the luxury yacht is expected to be taken from the drawing table to market availability within just 24 months. Stella will feature more than just an expansive sundeck with a pool and beach club: Stella is to be kitted out with top of the range water toys. Her garage will host water skis, diving equipment and a tender every bit as refined as her own design.Following the true contemporary vision of our time, Red Yacht Design has placed emphasis on space utilisation and ease of movement. 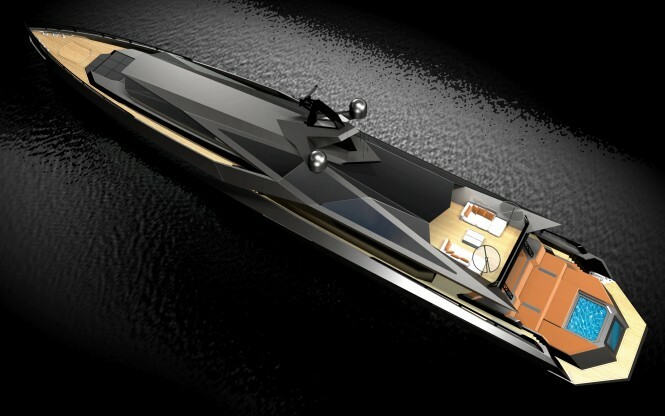 As such, the internal layout will not be fixed as the design passes into the hands of Mangi-May Yachts for construction. Current plans put the master suite at the front of the vessel for maximum privacy and to allow for a private spa complete with 2 balconies. However, guests can expect to find unsurpassed comfort in any one of her five suites. Stella will bring together high performance, beauty and guest contentment to ensure that she is a highly desirable luxury yacht once she is available for charter.